Files – Files will help you shape and trim the nails according to the client’s preference. You’ll need several in your kit because they should be able to file acrylic nails, natural nails, and buff the surface to a glossy sheen. We recommend that you have 3 to 6 files in your kit to begin. Nippers – Nippers are small, scissor-like tools that will allow you to cut small sections of the nails and cuticles. You should look for a tool that’s very sharp and precise because that would allow you to remove the nail or cuticle painlessly and efficiently. Tip cutters – Tip cutter are used to clip artificial nail tips precisely. They come in different shapes and forms and can be used to clip round tips or box tips according to your client’s wishes. Brushes – Nail brushes are used the brush away any dirt and debris around the nails and in the nail bed. They’re an essential aspect of any toenail treatment kit because they’ll prepare the nails for further cleaning and shaping. Cuticle pushers – Cuticle pushers are used to push back the cuticles. You should purchase a multipurpose one because it would offer more value for money. Sanitization system – Every nail technician must have a sanitization system of some sort in their kit. This will protect your clients from infections and other such problems. If you intend to open your own nail salon, you will have to stock your salon from ground up to ensure you can provide the best service to your clients. 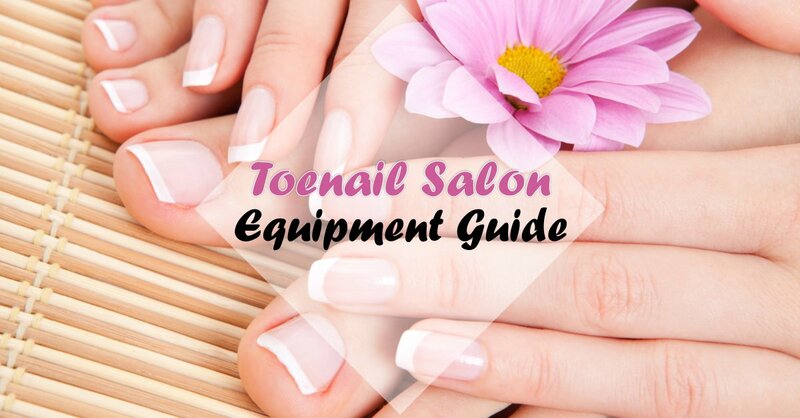 Here’s what you need if you intend to start a new nail salon. You will need to add the basics list to the list mentioned below. Furniture – A nail technician will need some basic furniture to ensure they and their clients are comfortable. Your salon should have a table, lamp, at least two chairs, and some furniture for the lounge or waiting space. You’ll also need racks to store your nail equipment and add some decorative elements to your salon. Office Equipment – Your salon must have a small office space to store all of your business requirements. You’ll need a separate desk and chair for it along with a telephone line, cash box, computer, printer, and file storage cabinets (optional). You will also need business cards to give your clients so they know where to call and have something to give to their friends if they want to refer you. Business license – As a nail technician, you will need a business license and will benefit from an insurance. Nail Polishes – If you want to be a successful nail artist, you need at least 25 nail polish shades in your collection. You will also require base coat, top coat, and perhaps a peel-off base coat for easy removal. Accessories – Common nail salon accessories include towels, brush cleaner, nail adhesive, pedicure bath, and manicure bowl. You will also need a solvent for removing artificial nails, gel systems, fiberglass systems, and liquid-and-power systems, etc. Liquids and Creams – For the manicures and pedicures, you’ll require soaking solution, cuticle oils, sloughing lotion, moisturizing lotion, and some hand sanitizer. You will also need a polish remover and cuticle remover in your kit for nails and feet treatment. If you have any questions about pedicure or want to know more about pedicure products, you’re free to contact us at Pedi Source. Just give us a call at 1855 429 PEDI. You can also email one of these two email address with your questions and contact details: [email protected] and [email protected].